It seems that Land Rover likes to show off the pulling power of its latest Discovery model by using it to tow unusual things. At the launch of the Discovery back in 1989 the first Discovery was used to tow a train and Land Rover went back to the rail theme again last year when it towed another train a short distance. This year the Land Rover Discovery outdid itself with perhaps the most impressive display of pulling power yet. Unfortunately, Australia’s outback is a little bigger than just 16km so it didn’t quite make it across the outback … but it did tow this monster 110 tonne road train for 16km on a closed stretch of highway. 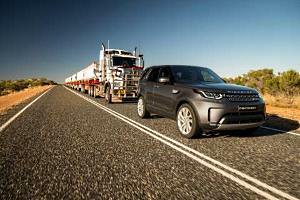 It had to be closed for the test because no Land Rover Discovery Td6 is rated to tow more than 3,500kg on a public road and no road train is permitted to haul more than 4 trailers … the test rig had 7 and the prime mover plus 10 extra tonnes of ballast. The prime mover had to be left on the front of the trailers because, without it, the trailers had no brakes … a scary thought when you have 110 tonnes of road train about to run right over the top of you. 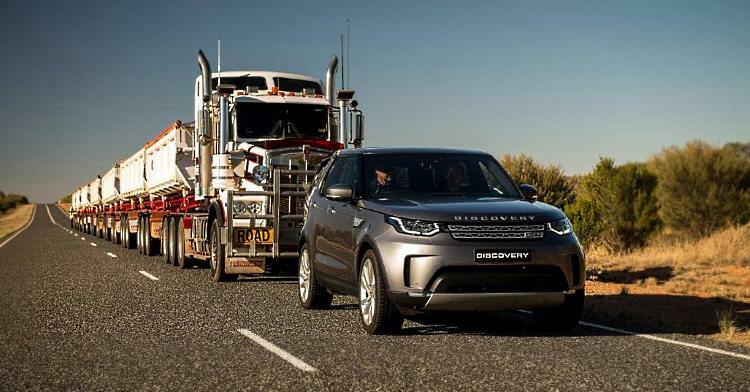 So, despite the fact that this towing test only ran for 16km … and not across the Australian Outback … it is still an impressive piece of work by the Land Rover Discovery and it did it all with a standard 190kW 3.0-litre diesel engine with four-wheel drive engaged. Oh, and in case you were wondering; the trucking company won’t be using Land Rovers to haul their trucks any time soon. The maximum speed the Discover could reach with 110 tonnes behind it was just 44km/h.